Spring has finally started to arrive around these parts! Yesterday, I took a walk with my daughter and we collected all of the pretty flowers and herbs shown in the basket above. After she asked me about how I planned to use some of the flowers, I realized that I’ve never written up a “things to make” post about one of my spring favorites – forsythia flowers! Forsythia bushes (Forsythia suspensa) not only offer a pretty burst of color in early spring, the flowers are also edible and can be used in many food and DIY beauty & body care recipes. If you’re pregnant or nursing, don’t take forsythia internally without checking with your healthcare provider first. 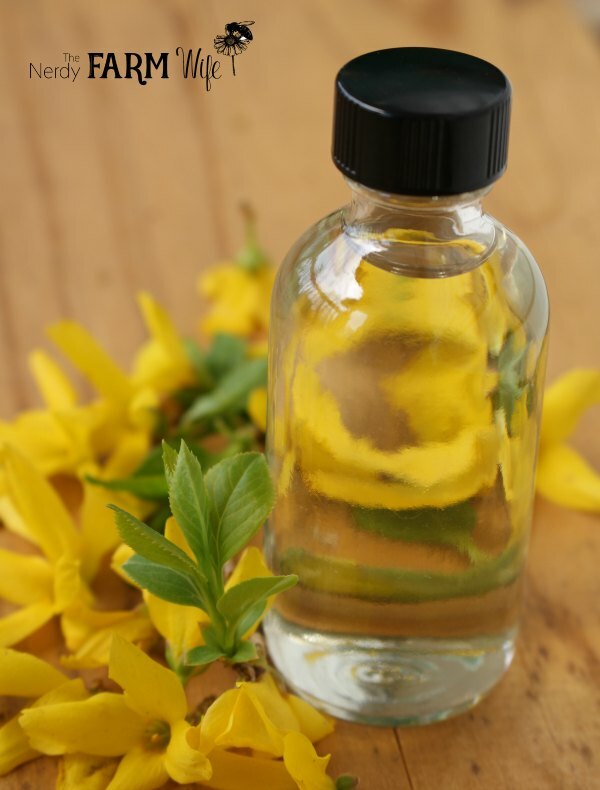 Make up a jar of this oil to have on hand for lotions, creams, soaps and lotion bars. 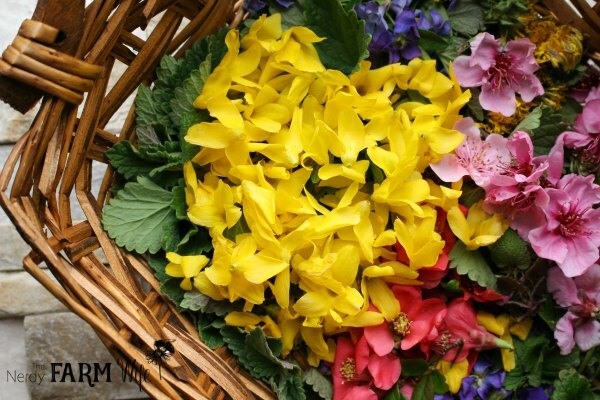 To make: Collect fresh forsythia flowers and spread them in a single layer on clean dish towels or paper towels. Allow to air dry for a few days. Fill a jar half-way with dried flowers, pour oil into the jar until it’s almost filled, then stir a few times to release air bubbles. 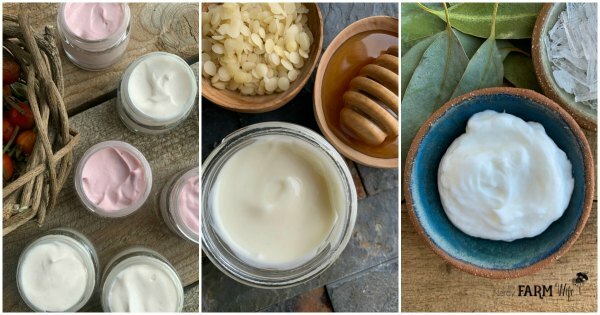 Suggested oil types include olive (for soapmaking) or sunflower, grapeseed, sweet almond or rice bran for lotions, creams and lotion bars. For a quick infusion, heat the oil uncovered on low for 2 to 3 hours in a small saucepan containing a few inches of water. For a slow infusion, cover with a lid and infuse in a cabinet for 4 to 6 weeks before straining and using. 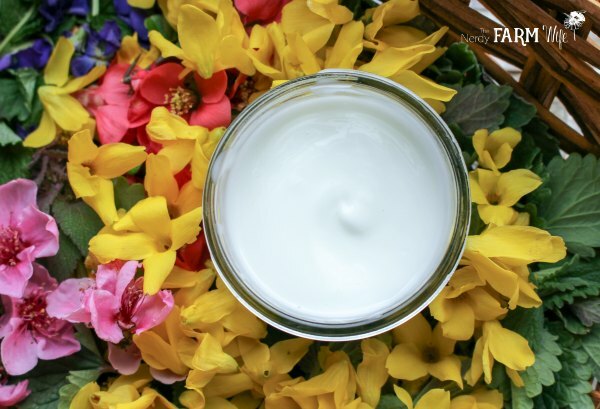 This lightweight lotion is especially suitable for those with oily and acne-prone skin, but can be used as a nongreasy moisturizer for all skin types. You’ll need an accurate scale (like THIS ONE) to make this recipe. Weigh the distilled water and witch hazel in a heatproof container. Place both jars down into a saucepan containing a couple inches of water, forming a double boiler of sorts. Turn the burner to medium low and heat until the wax is fully melted – about 10 to 15 minutes. Pour the hot water/witch hazel and melted wax/oil together into a clean jar and stir briskly with a fork for several minutes. Stir frequently. The lotion will thicken as it cools. I often place the container down into a bowl of ice water to help speed this step up. Once cool enough for your preservative of choice, stir that in and mix well. Add essential oil if you’d like. Tea tree is especially helpful for acne prone skin, while lavender is nice for all skin types. Pour into lotion containers or jars. Jar shown is a 4 oz canning jar. * There are many choices when it comes to preservatives. I currently like Leucidal SF Complete (ECOCERT/COSMOS approved, Lactobacillus & coconut ferment) used at 4% (or 4 grams in this recipe). 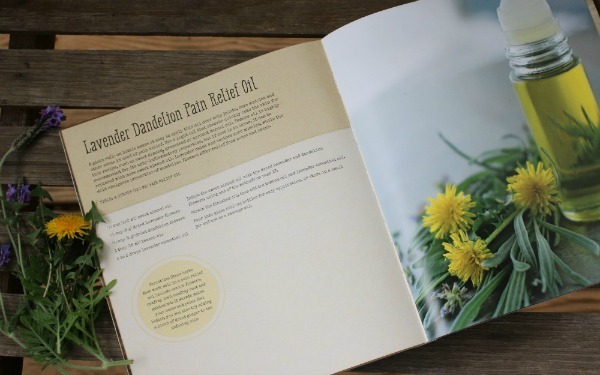 Check LotionCrafter, The Herbarie & Formulator Sample Shop for more options. 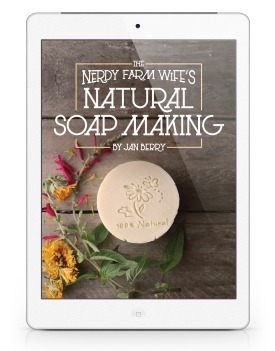 Are you interested in making natural lotions and creams for you and your family? Confused about preservatives and emulsifiers options? 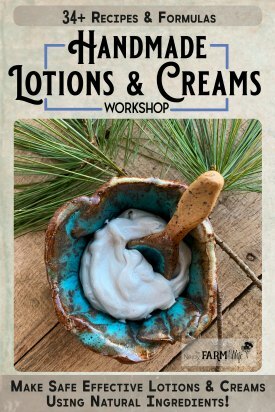 If so, my Handmade Lotions & Creams course was made just for you! 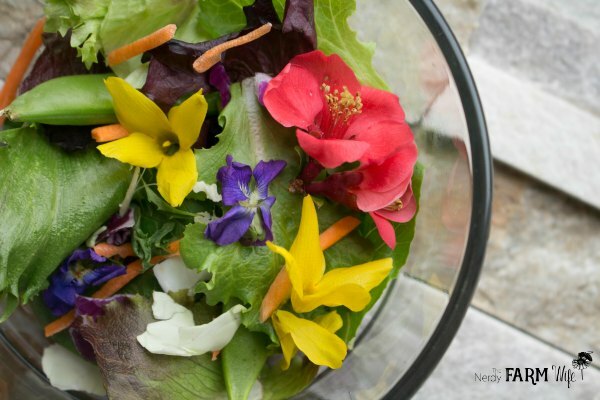 Learn how to make this delightful spring treat by visiting the Homestead Lady. This toner is great for skin that tends towards redness and breakouts. To use, dampen a fresh cotton ball with the toner and swipe over your face after washing. Pour the hot water over the forsythia flowers and steep for 10 to 20 minutes or until the water has turned a light yellow color. Strain. Mix 1/4 cup of forsythia/water infusion with the witch hazel and glycerin. Stir well and pour into a small glass bottle or jar. Store in your fridge for 2 – 3 weeks. Forsythia flowers are edible and can be used to sprinkle over salads along with other spring blossoms such as violets and flowering quince. They add such a simple and pretty touch to mealtimes! 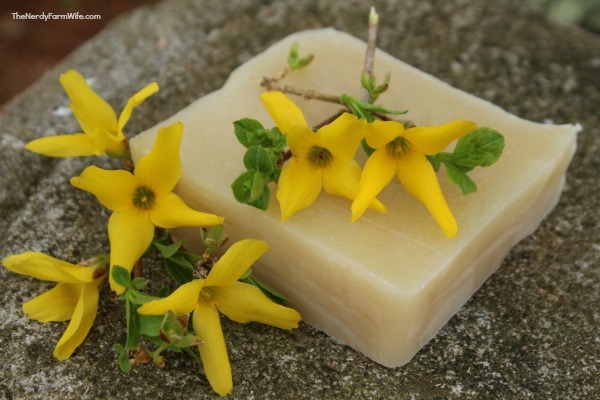 This cold process forsythia soap recipe includes both a tea and infused oil made with forsythia flowers, giving it a light natural yellow color. 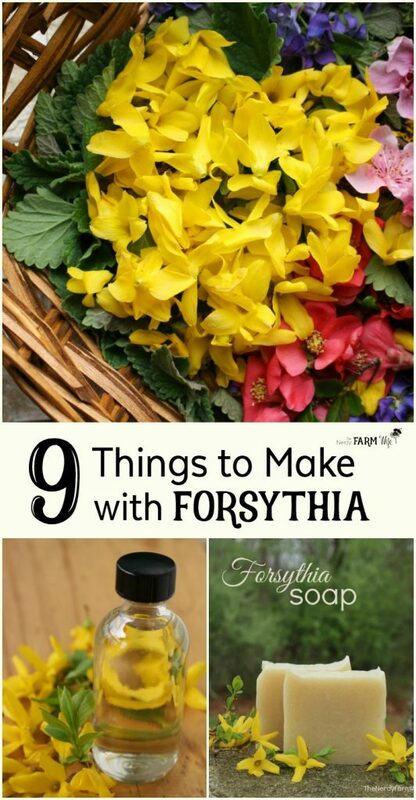 Read more about it in my blog post on how to make forsythia soap. 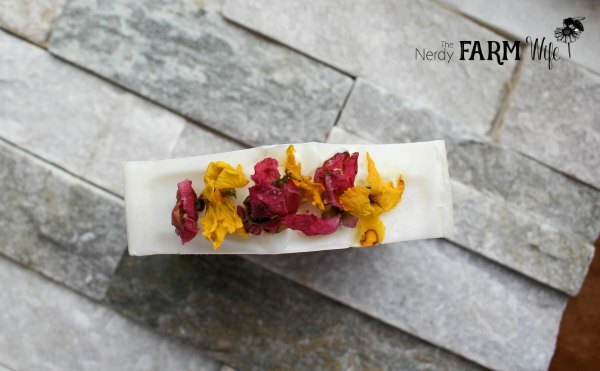 You can also dry the flowers and use them to decorate handmade soap. Press the centers very lightly onto the top of your soap. Avoid pressing too hard into the soap batter or the petals will turn brown – see the bottom right petal for an example. This delicious forsythia flower syrup is naturally sweetened with honey and is perfect served over pancakes or stirred into tea. Learn how to make this yummy recipe by visiting Grow Forage Cook Ferment. These pretty floral foot scrub bars are simple to make and require just three ingredients: sea salt, fresh flowers and coconut oil. They’re perfect for smoothing rough feet and getting them ready for sandal weather! 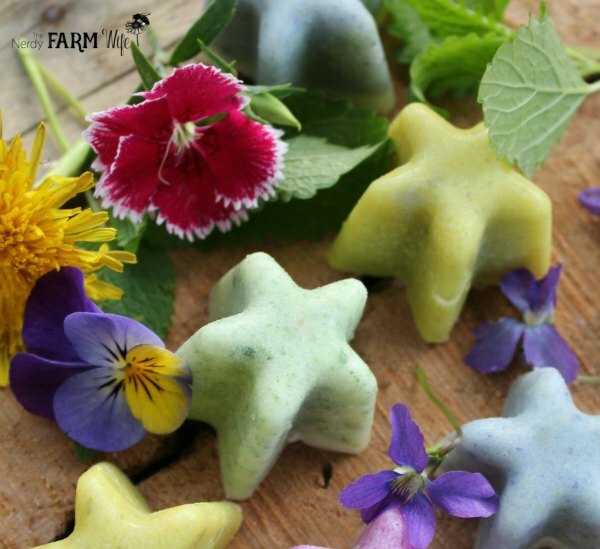 Learn how to make them by reading my blog post, Spring Flower Foot Scrub Bars, and using forsythia flowers in the recipe. 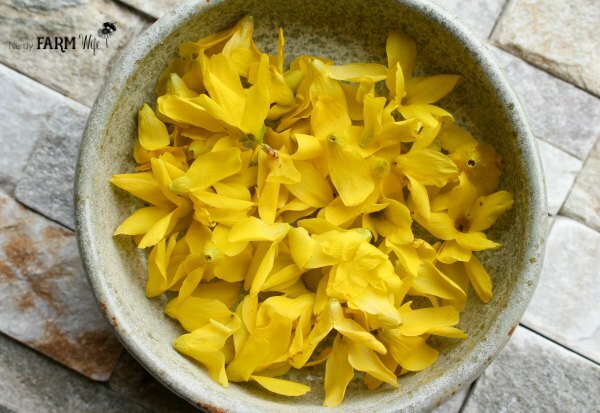 If you enjoyed these 9 creative ways to use forsythia flowers, let’s keep in touch! Tagged forsythia. Bookmark the permalink. Thanks so much for including our forsythia jelly post! These are all great ideas – that lotion looks divine. These are great recipes! We recently moved and our new yard has more forsythia bushes than I have ever seen in one yard.